← How to merge PDF file under Linux system by PHP code? Using the advanced pdf command line toolkit to reduce a very large page size down to letter, we're seeing all embedded PDF web links on the page being lost except for the very first one when the conversion is completed. We're using the -x and -j commands to rescale all the pages. This appears to be the only problem we've seen with this rescale function at this point. The one link that does seem to survive is showing a different cursor than the unconverted document, and it IS properly positioned. This is a critical issue and I may need to discontinue using this tool if I can't get the links back. Attached are two files, EZ-Order-Form.pdf is the original document before rescaling. 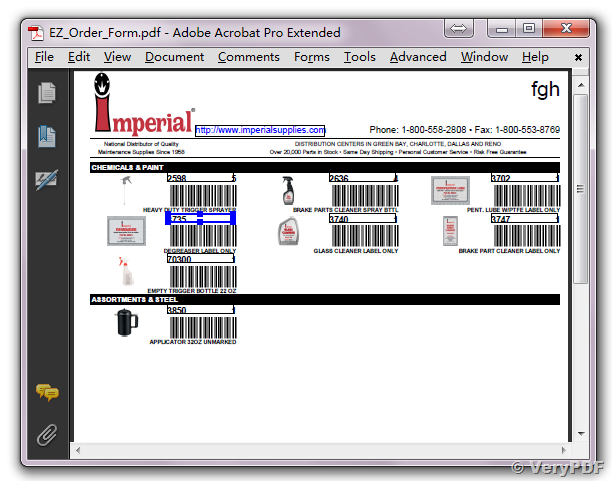 EZ-OrderRS-Form.pdf is the version where resizing was applied. 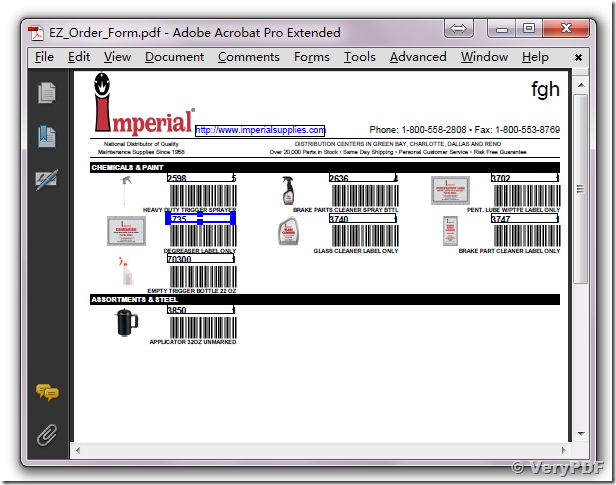 Each barcode image has a part number over it to the upper left, then a package quantity to the right. All item numbers on those pages are hyperlinked in the original. Viewing in Adobe Reader XI, you will see the missing links in the RS version, and the different pointer cursor when you hover over the "http:" link at the top of the document. pdftools.exe -i D:\downloads\EZ_Order_Form.pdf -o D:\downloads\_EZ_Order_Form.pdf -x "0 0 612 792" -j "612 792 true"
What are new features included in the latest version of PDF Editor Toolkit Professional Version? How to count the number of PDF pages in a folder? How to register your Advanced PDF Tools Command Line? This entry was posted in Advanced PDF Tools and tagged Advanced PDF Tools Command Line, PDF tool, pdf tools, resize PDF page. Bookmark the permalink.